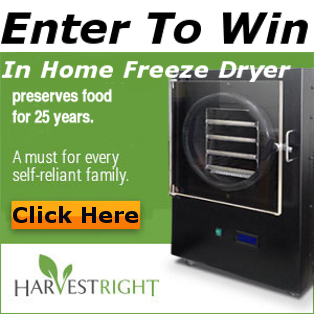 In Home Freeze Dryer Giveaway! I listen to many shows on Prepper Broadcasting, one of my favorite resources for information as they broadcast prepper/survival related shows 24 hours a day. Many of the shows are live and allow interaction either through their chat room or by calling into any live show to put in your own two cents. The chat room also allows me to visit, argue, or agree with others in real time, very cool. They’ve done several give-a-ways on Prepper Broadcasting, mostly books, one show a custom made A.R. 15 (I didn’t win). Last night they announced a new give-a-way. Their guest was the owner of HarvestRight and no, they don’t sell garden seeds. They sell in-home freeze dryers, survival tents and such. I did not know you could even buy an in home freeze dryer and guess what? They’re giving one away on Prepper Broadcasting. This is the link to enter and listen to the show http://prepperbroadcasting.com/2015/02/20/home-freeze-dryer-give-way/ . I learned a lot about freeze drying during this show. The owner of the company shared his vast experience in technology and how it came to be he decided to create and start up the residential freeze dryer company. He explained how a freeze dryer works and fielded several questions from the chat room on all the freeze dryer can do. Dan (remember his name now) answered questions on power usage (110) maintenance, warranties, and of course the cost. The latter being my biggest concern. Unless your the lucky winner of the contest expect to pay around $4,000.00 to be the owner of this ultimate prepping item. It sounds like a lot of money but after listening to the show and only a little thought it’s pretty clear how fast you can get your money back. Freeze dried food is expensive. If you can freeze dry your own leftovers or all that is generally thrown out after the garden is harvested and have it last for 25 years you’ve already saved a lot of money. But how ’bout this; Think of having an extra $50.00 or so on occasion to purchase food simply to freeze dry it. If you did this once or twice a month in no time at all you would not only have increased your long term food supply that will last 25 years but imagine what that food is going to cost in 25 years let alone 10 or even 5 years. You’ve paid for the freeze dryer! All I can see are dollars in my pocket. I figure my odds of winning are good, better than the lotto, even after sharing this with my friends and those of like minds on A.P.N. If I don’t win maybe a friend or family member will and I will still have the use otherwise you can bet I will find other things to cut that waste money in order to buy one of these machines. Thanks HarvestRight and PrepperBroadcasting! Enter to win contest HERE! A Giant Appears and Don’t Lose Focus!